Also, the Chef has been known to knock back a tumbler of 99 cent airline bottled gin and juice (orange) during grueling midnight blog sessions. As for the Pepper Jack, the Chef likes his quesadillas -- add two slices of pepper jack folded into a flour tortilla (a 99c only Store staple) and sautee until the cheese melts. 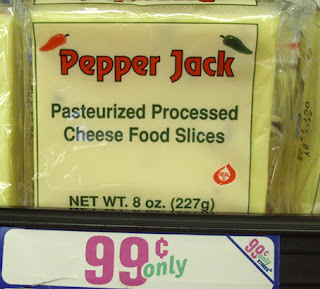 This Pepper Jack uses jalapeno peppers and gives a hot kick; it also melts divinely. Both Deals of the Day have been available off and on, the last couple of months. 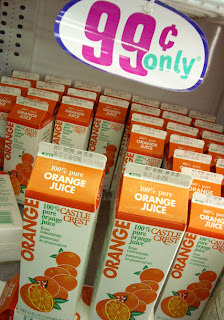 Look for them at your local 99 Cent Store. The Chef has counted the Oscar ballots from comments and tallied your emails. "No Country For Old Men!" 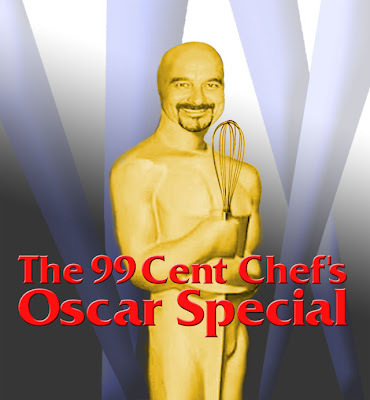 To review The Best Picture Entrees and watch The 99 Cent Chef's Oscar Special video click here. Congratulations and here is the recipe. Brown bacon in pan. 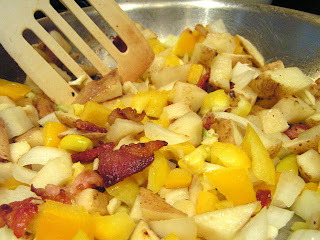 Saute chopped potato, bell pepper, onion and garlic covered for 10 minutes, stir potatoes to cook thoroughly. Finish cooking uncovered an additional 5 minutes. 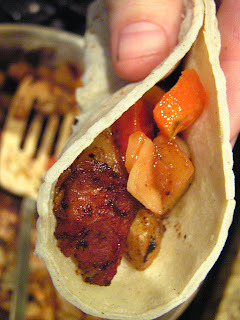 Heat corn or flour tortillas. Top taco with Picante sauce. The Chef is introducing a new feature called "Deal of the Day." You must act quickly to take advantage. 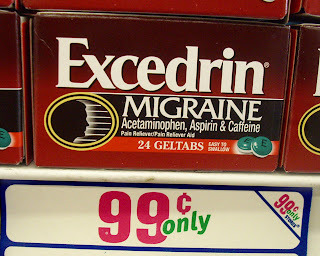 As an example, today I was in line eating from a 99 cent bag of pecans and the Armenian fellow in front of me was eyeing my basket full of nuts; I offered him a pecan, he tasted, dropped his basket, went and grabbed four bags, then thanked me; meanwhile the Hispanic lady behind me grabbed a few pecan bags as well. The three of us depleted the pecan stock in a matter of seconds. So when the Chef posts "Deal of the Day," rush to your local 99c only Stores to take advantage; if you tarry please do not blame the Chef if "Deal of the Day" is not there when you arrive. 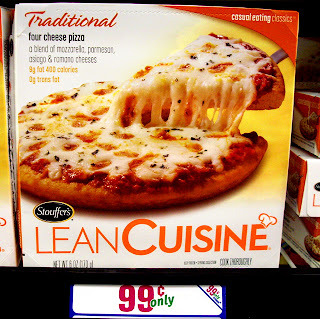 Today the 99c only Store, in Hollywood, has a four cheese pizza by Lean Cuisine. The Chef occasionally diets as much as the next person; while tasty, this is the most anemic frozen pizza out there. Hey, Lean Cuisine, how about less dough and more cheese. Don't believe the photo! 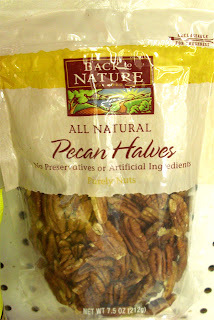 Back to pecans; what a thrill to see unsalted pecan halves in the 99c only Store. A remembrance of things delicious. What the Madeline is to Proust, the Pecan is to The 99 Cent Chef; a memory trigger to his southern past. One bite of a pecan and the levee of memory overflows. The Chef is flooded with images of his earliest youth under the shade of a pecan tree gathering its fallen crop for his "Nanny" (grandmother) to be turned into a warm pecan pie, while visiting her in Paris, Texas. The Chef is lucky that his mother still makes a pecan pie when he visits her in Louisiana. Another pecan delicacy is the Praline, a sugary, nutty confection. If you visit the French Quarter in New Orleans, go to Praline Connection. They make a delicious Praline combining two of the Chef's favorite ingredients, Bourbon & pecans. 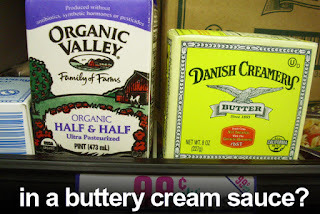 In a saucepan, bring cream and sugars to a low boil, stir with a wooden spoon until mixture thickens, about 10 minutes. Add Bourbon, butter and pecans and continue stirring a couple of minutes. Turn off heat and allow to thicken slightly, then spoon cookie size amounts on wax paper a couple of inches apart to allow for spreading. The pralines will harden into soft candy as it cools down. Makes about a dozen pralines. The Chef picked up two 9oz. 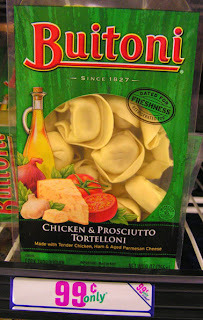 packages of Chicken and Prosciutto Tortelloni from the refrigerated case at my local 99c only Store last week. 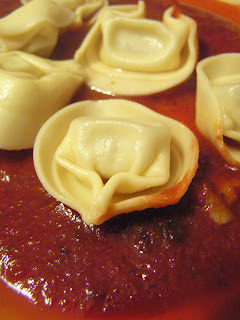 The Tortelloni is subtly flavored, so a light tomato sauce is an ideal accompaniment. 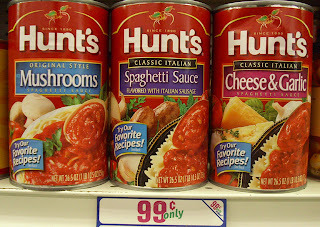 The 99c only Store always has pasta sauce, from Organic crushed tomatoes to Name Brand pasta sauce. 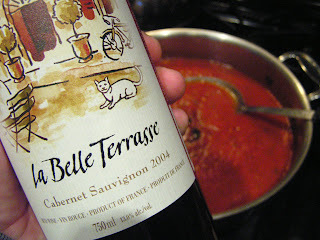 He likes to add olive oil and a fine 99 cent French Cabernet Sauvignon to deepen the flavor of the pasta sauce. Start 8 cups water to boil the Tortelloni. 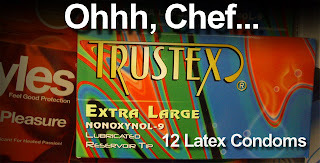 In a pan, add a large can (28 oz.) of tomato sauce, 1/2 cup red wine and 2 tablespoons of olive oil. 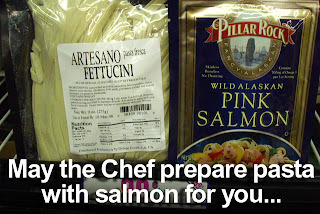 Simmer the sauce at medium heat the length of time it takes to prepair the Tortelloni. 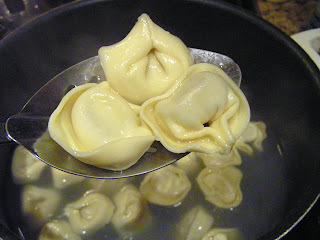 Follow directions for cooking Tortelloni (low boil for about 10 minutes.) Drain and plate with pasta sauce. 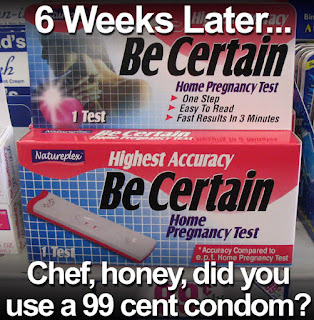 The 99 Cent Chef is a hopeless romantic. 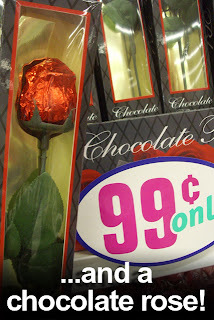 Pour yourself a glass of wine and please join the Chef for a 99 Cent Valentine's Day photo story. 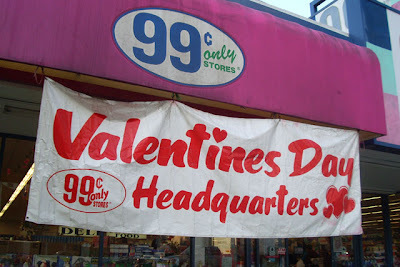 All items cost 99 cents and are located at this store. In The Chef's latest video, he has created an Oscar worthy entree for each Best Picture Nominee. Which entree is deserving of a Golden Whisk? You do not have to be an Academy member to cast a ballot -- just vote in the "comments" section. 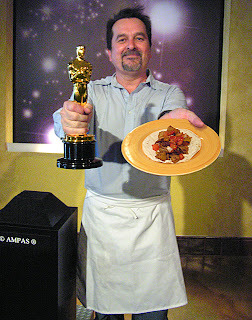 The Chef is a bit of a trickster, but the Oscar he is holding in the video is real. If you are in L.A., the Oscar is yours to hold, too. On level 4 at the Hollywood & Highland Central Courtyard (click here for info) actual Oscars are on display until February 23rd, and a special photo op area is set up for the public; so bring your camera, get your acceptance speech ready and hoist the Golden Boy high. Last year The Chef made the pilgrimage and shot a "Real People and Oscar" video (click here) that you can check out. "Real People and Oscar 2008" is here. "Atonement," "Michael Clayton," "Juno,"There Will Be Blood," and "No Country For Old Men." 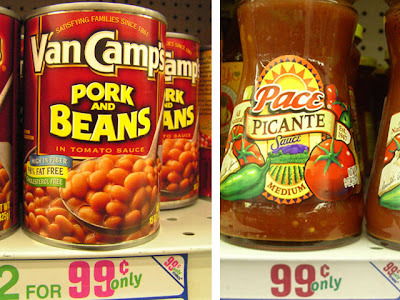 And the Golden Whisk goes to: Tex-Mex Taco, Baloney Sandwich, Hot Dog, Turkey Chili, or British Baked Beans on Toast? Vote in comments! 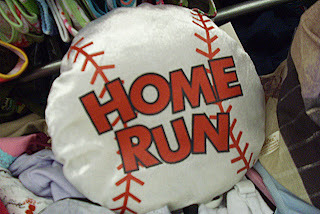 99 thanks to Pete Handelman for his direction, camerawork and voiceovers. The Chef picked up some Louisiana style Dirty Rice from the 99c only Stores to cook today, on this Mardi Gras Fat Tuesday. Last Sunday, while listening to Harry Shearer describing the Mardi Gras experience on KCRW's "Le Show, the Chef flashed back to his high school hitchhiking days: thumbing rides with his best friend; two longhairs trying to get to the the biggest street party of the year, New Orleans' Mardi Gras. Being picked up by a "hippie van" that was playing Jackson Browne on the car stereo, getting high, then being dropped off near the French Quarter; a good time had by all. 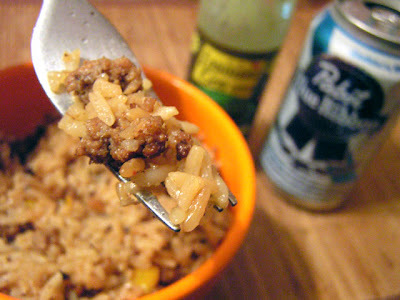 Dirty Rice is the simplest Cajun dish to prepare -- just ground meat and rice. 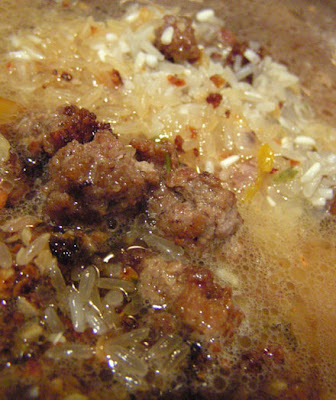 I double the box recipe by adding an extra cup of rice and a pound of sauteed ground meat. 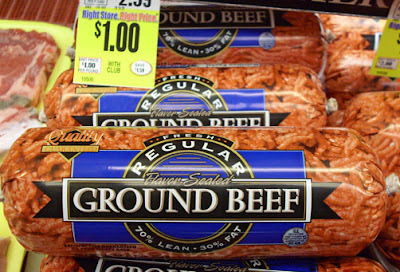 The Chef has not seen ground meat for 99 cents lately, but at Ralphs it goes on sale for a dollar a pound. 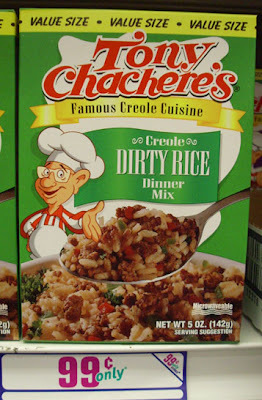 Next time you see The Chef, he will refund the difference to you: just say "Dirty Rice." 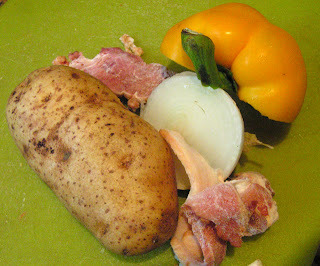 Extra ingredients: Chop 1\2 onion & bell pepper, 2 cloves garlic and saute lastly, with meat. 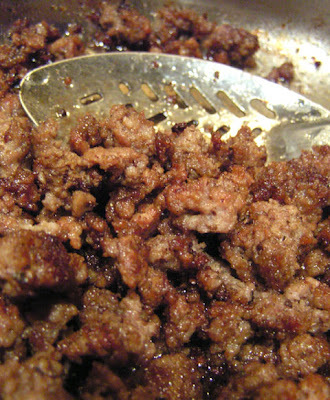 Saute ground meat until brown; this gives rice its "dirty" color. 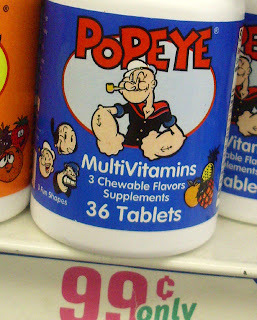 For the diet conscious, pour out rendered fat. Add rice and water; bring to a boil, then reduce heat to low and cook covered for 20 minutes then turn off heat and let stand for another 10 minutes. Serve with plenty of hot sauce. For a local Dirty Rice fix, Popeye's Fried Chicken does a mean one.